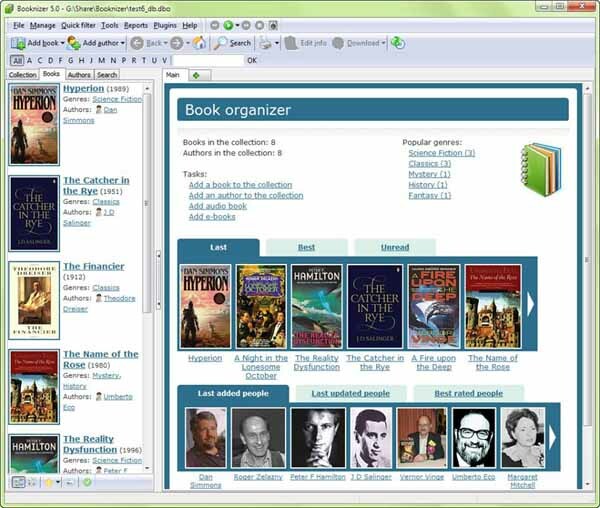 Free download Booknizer Latest Version. Booknizer is a book organizer that will help you sort your home library easily and in a convenient way. You can add any types of books into your database, including e-books (electronic books), usual paper books, and audio books (all popular audio book formats are supported). Depending on the type, you can choose the best method of adding your books to the database. Audio books can be added to your database in a similar way, using the built-in file scanner. Booknizer supports all popular audio formats, including MP3, M4a, M4b, MP4, AAC, and others. The program includes a built-in audio player, so it is possible to listen to your audio books directly in the program. There is also support for external software players, you can associate your audio books with any player of your choice. What about paper books? Well, one cannot use a file scanner on them, but there are other options. First of all, any book (including audio books and e-books) can be added by title. Just enter the title in the corresponding field of the “Add book” dialog, and Booknizer will download information about the book from the internet. However, as usual, Booknizer offers you more options. If you have a barcode scanner, just scan the barcodes of your books into the program, and Booknizer will do the rest automatically (recognize titles, download information about the books etc.). The library manager also accepts barcodes and ISBNs entered manually. If you do not have any barcode scanner, try scanning barcodes with your webcam.